Does anyone know of activity in this area? My family has 240 acres in this area with my mom owning 48 of it. She is getting offers to sell for $15,000 an acres from Mallard Minerals LLC. It might just be a fishing expedition on their part. I think she has 3/16 production royalty. We have heard nothing from the oil company. I fear my mom is going to sell without truly knowing what it’s worth. Amie: Roan Resources & Oklahoma Energy have each applied for Increased Density wells (6 more wells by Roan) in this section. There are multiple units surrounding the Section that have multiple wells on them. That is a good offer for this area, but one never knows how much oil/gas are going to be found or what prices we will receive for those products. I wouldn’t take a dime less than that & if your mother really wants to sell, she should ask for more. It never hurts to ask. Yes, $15,000 is a good offer BUT you have to realize that doesn’t mean they are really going to pay that much. I went through this early this year with a similar offer, the SOB tied me up for more than a month and kept making excuses (we had a signed, notarized purchase offer) and finally the buyer came up with an excuse that it wasn’t worth as much as they thought, cancelled the offer and made another much lower one which I refused. Like others will tell you, check out the buyers, check to see what things are worth, whatever they offer is likely much less than it’s worth and if companies are filing for well permits you know they think there is oil so holding on to it may be worth more in the long run. Get as much info as you can and be very careful if you do decide to sell, don’t sign anything until you know you will get paid (money in escrow). Thank you John, how do I know if companies are filing for well permits? How do I find out what activity is goin on? There has been absolutely no communication with my mom from them. You can sign up for a daily email report of well permits and completions (for free) www.oklahomawells.com , it’s how I keep track of what is happening in our sections. For more information you can also go to the Oklahoma Corporation Commission website and search their database (it takes some practice and learning but they do have instructions) apps.occeweb.com and for instructions Oklahoma Corporation Commission If there are any filings/requests that affect your area (section, etc.) you should be getting mailings outlining the requests. This forum is a good source of info and I’m sure others that have a lot more experience can give you a lot more advice. What is your mother’s name & I will send you a copy of the recent filings with the OCC? 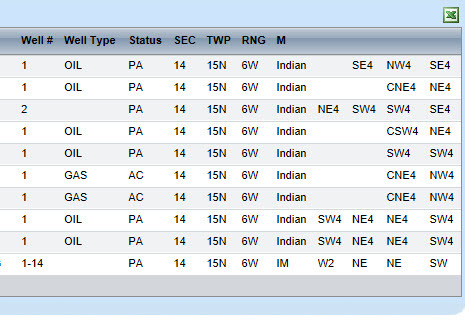 Thank you John, for the status of a well what is the difference between the status being PA and AC? Hi Todd thank you for your help, I would need to talk to her before posting her name on a forum. PA is plugged and abandoned. AC is ACtive, but that does not always mean producing. I found all of the recent filings. Looks like they had a hearing on Monday, to discuss density wells along with two horizontal wells they want to drill on a pooled property of 640 acres of which 240 belong to my family. I don’t think they would go through the expensive trouble of drilling two horizontal wells if they didn’t think it would produce. Do you have mineral rights in Oklahoma? Mallard Minerals is the one that made the offer. Have you heard of them? Looks like they are out of Tulsa. Yes, I own minerals all over OK as well as TX, NM, SD & AR. I am from Blaine County, OK originally and have been a landman for 35+ years. As for Mallard, I’ve heard of them & get letters from them but have never done any business with them. With the new horizontal drilling accuracy, most wells drilled today will “produce”. The question are how much & at what price are we getting for the hydrocarbons. I’m quite confident that multiple wells will be drilled in you section. Thank you Todd. I provided all of the information that I was able to find about my moms mineral rights last week and she will not be selling now that she has knowledge of what is going on. Truly appreciate everyone’s guidance! !